Convergence is leading to a new understanding of video security in stadiums and sports venues, with technology forming one side of a triangular approach. Personnel training and processes make up the other two. Together, all three support a strategic deployment that protects venues from attack while enhancing a family-friendly experience for spectators. The tripartite formula is a primary message the National Center for Spectator Sports Safety and Security (NCS4), the nation's leading center for academic and certificate programs in stadium and arena security, promulgates. Based at the University of Southern Mississippi, Hattiesburg, Miss., NCS4 offers campus-based and online academic and certificate programs in stadium and event security. The past few years has created another nexus. An increased understanding of best practices has tracked with the increased integration of IP in security systems and a spurt of new stadiums that have opened in New York, Dallas, Minneapolis and Washington. Elsewhere, a number of facilities have undergone extensive renovation, including M.M. Roberts Stadium (pictured) at the USM campus. "It's an industry that's growing," said Dr. Lou Marciani, NCS4 director. "As awareness about security grows, there has been more updating of people skills, venue training and technology." The Oct. 2 game at M.M. Roberts between USM and Marshall also marked the debut of an integrated video security system designed to increase spectator safety as well as assure greater attention to the fan experience. The surveillance and security system, provided by Avigilon, will serve as a working laboratory for study of stadium security. The center and the system has attracted experts from the NCAA, the NFL, Major League Baseball and FIFA, soccer's international governing body. NCS4's charter is to study techniques to mitigate security risks inherent with large sporting venues and provides training, research and technology," said Dave Tynan, vice president of global sales and marketing at Avigilon. Security professionals, be they local in Hattiesburg or at NFL offices in New York, will be able to access the system to construct game-day scenarios, he added. The program also collects and incorporates best practices from stadiums and arenas around the country. The NFL, for example, is particularly interested in ways video can be used to enforce the league's code of conduct. The new approach is much more strategic and operational, Marciani said. "You must keep a balance between safety, security and the fan experience," he stated. With tools such as megapixel cameras, which can zoom in extremely tightly while retaining resolution, Marciani said supervisors can quickly identify a situation and respond before poses a significant danger. The Avigilon deployment at M.M. Roberts stadium includes a network of six 16-megapixel cameras that covers 85 percent of the stadium interior. Video also covers entrances and exits. Outside, megapixel cameras can be deployed on wireless portable platforms. Video is managed at the nearby NCS4 center, but the same video is also accessible by campus police, local law enforcement, and if necessary, NCAA offices offsite. Stadium and sports venues represent a major vertical for the Vancouver-based company. 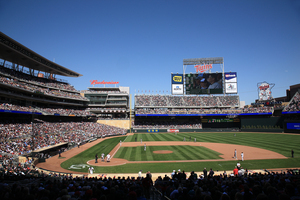 Other installations include Target Field in Minneapolis (pictured), Wrigley Field in Chicago, and Canberra Stadium in Australia. Along with Marciani and Tynan, others see the same trend in sports venue security, "Other parts of the [organization] see video from an operational point of view," said David Jackson, senior product manager for NVR, video analytics and clients at Tyco Security Products, which has done a number of stadium systems. There is growing appreciation for the field of view megapixel provides, Jackson said, and, with features such as digital pan-tilt-zoom, their ability to replace several standard cameras. For example, Jackson said, control centers can view four separate panes from one gate-mounted camera, zooming in on specific scene, while still providing a broader picture of crowd flow. Revisit our podcast with NCS4 director Lou Marciani from last October.